Young quarterbacks have been knocking at the door for years, but the old guard has held strong and continues to make up the bulk of starter-worthy fantasy options. 2019 will be the year the young group kicks the door down and plants their flag. This changing of the guard will be one of the major fantasy storylines for the 2019 season. Despite the sheer dominance of young players in recent seasons, the old guys are pretty, pretty good. The average age of fantasy QBs (top-12 quarterbacks) is much higher over the last five years than the previous five. In fact, in 2018, fantasy QB1s had been in the league for an average of nine years already — compared to seven years from 2009-2013. Yes, fantasy QB1s are getting older — but that’s largely due to the fact the quarterbacks themselves aren’t changing. “Old guys dominating” has been particularly true since 2014. 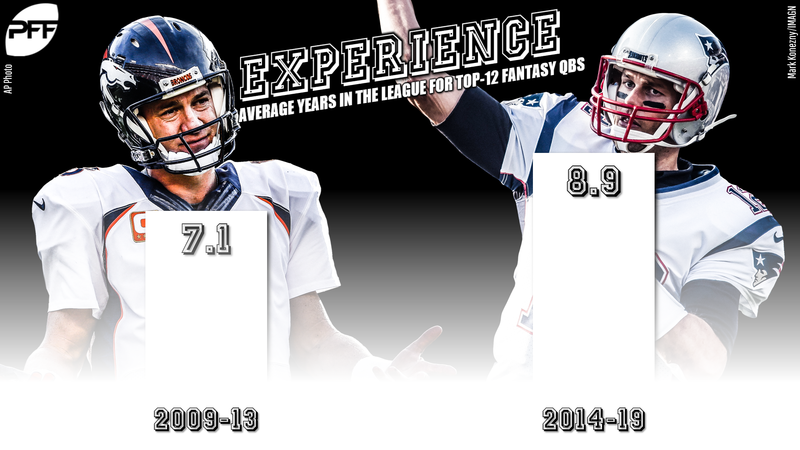 From 2007 to 2013, the average years in league of fantasy QB1s maxed out at 8.7 (in 2009) and was below 8.0 every other year. Since 2014, however, it has been above 9.0 in four of five years. This is too anecdotal to draw a real conclusion from, but I found it interesting, so I’m sharing it with you. 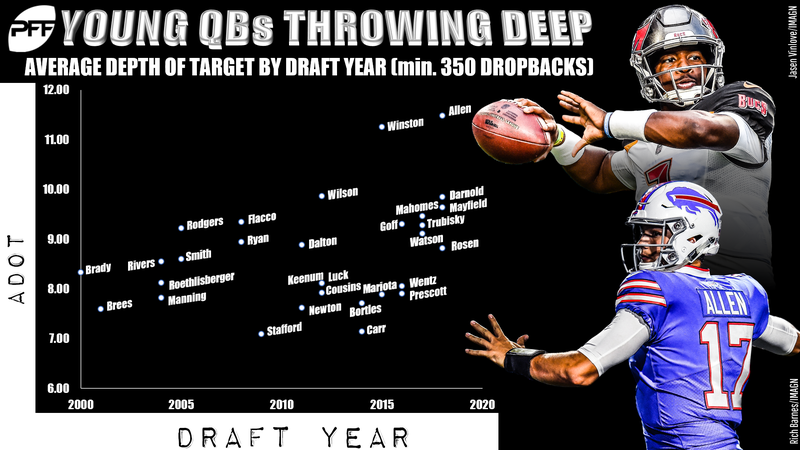 Eight of the top 10 quarterbacks in terms of longest average depth of target last year were drafted in 2012 or later. Six of the 10 had been drafted in the last three years. Which young QBs will step up to the plate? There are 14 quarterbacks whose 2019 season will be Year-8 (or less) who I think could legitimately be top-12 fantasy quarterbacks next season — and beyond. The odds are in the young crowd’s favor. Some of them have already proven themselves capable of fantasy stardom. Who will join them for the changing of the guard? Mahomes is locked in as a fantasy QB1 for a long, long time. His 5,097-yard, 50-touchdown season was one of the best of all-time; up there with some of the old guys he’s in the process of replacing. Watson had impossible expectations after his dominant rookie season, but he lived up to the hype by finishing 2018 as fantasy’s QB3. He’s leading the revolution alongside Mahomes. General Luck, one of the oldies of the newbies, returned from injury to post another top-five fantasy season. He’s not going anywhere. Goff stumbled down the stretch, and people will remember the poor outing in the Super Bowl, but on the year as a whole, Goff was fantastic. He threw for 4,688 yards and 32 touchdowns en route to the fantasy QB6 finish. The Rams have a solid nucleus around Goff, who still isn’t done growing. Wilson is a perennial fantasy QB1, and next year will be his eighth in the NFL, so he qualifies for my list. Prescott has finished as a top-10 fantasy quarterback all three years he has been in the league. He is not going to put up Mahomes-like numbers, but he has absolutely proven himself. Cousins just rattled off his fourth-straight fantasy QB1 finish, and it wasn’t even all that great of a year for him. Mayfield’s per-game average as a rookie (17.3 fantasy PPG) would have put him just on the outside of fantasy QB1 status in 2018. He should enter the ranks in Year 2 — and continue to climb as he progresses in his career. Trubisky averaged 18.6 fantasy PPG — though his average is largely aided by some massive, massive weeks. Inconsistency is an obvious concern, but Trubisky poured on the fantasy points on more than one occasion and outright won some people some fantasy games. If his production can stabilize, he’ll be in the running as a weekly fantasy starter. It might seem odd to include Allen, but he did score more fantasy PPG (17.5) than Mayfield as a rookie despite having virtually no offensive firepower in Buffalo. Allen’s legs are the fantasy equivalent of gold. Is he a sure thing? Obviously not, but the rushing ability does make him a legitimate candidate for this list. 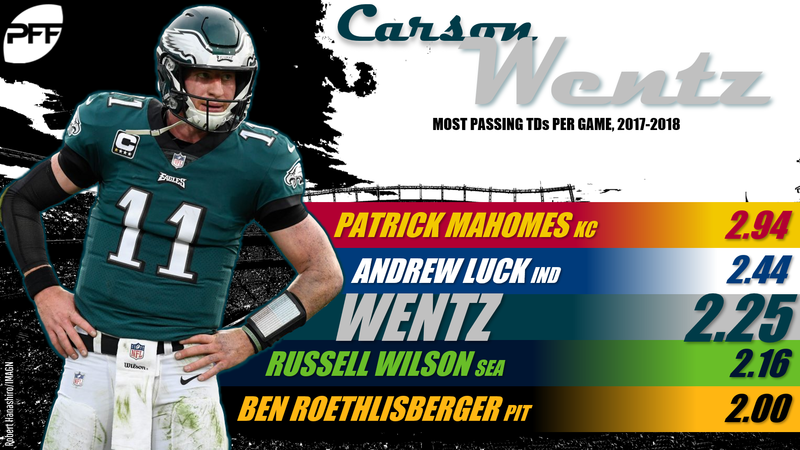 Wentz has now been unable to finish the year two seasons in a row, but when he’s playing, he’s easily one of the best young quarterbacks in the league. Wentz has averaged 2.25 touchdowns per game dating back to the start of 2017. As noted in my review of the 2018 rookie quarterback class, from Weeks 11-17, Jackson was the No. 5 quarterback in fantasy. He was putting up running back-like rushing stat lines with 150 yards and a coin flip’s chance at a passing touchdown each week. The rushing won’t diminish, and the passing should improve. Winston has legitimate top-five fantasy appeal when he’s (a) healthy and (b) not getting benched. Winston was a top-10 fantasy quarterback when starting in 2018. His average depth of target of 11.25 yards ranked second in the NFL among qualifying quarterbacks. Don’t forget about Jimmy GQ. He’s one of the key injured players to remember for 2019 and now has a record-setting tight end at his disposal in George Kittle.